Cycling Southland’s Erin Criglington has been a dominant force in Masters track cycling over recent years, winning multiple national titles on an annual basis. 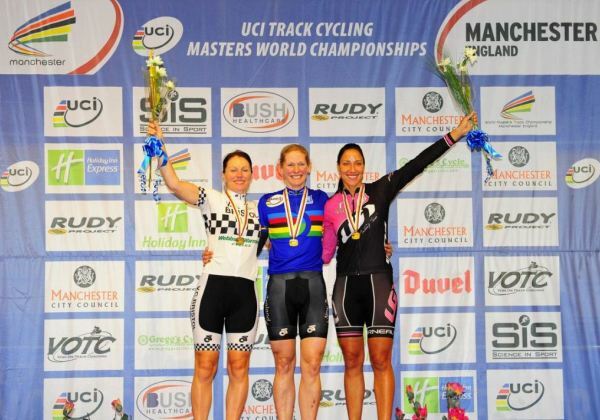 She can now add a World Championship gold and a coveted rainbow jersey after winning the 40-44 Individual Pursuit at the World Masters Track in Manchester this morning. With two silver medals to her credit from the Time Trial and Scratch race earlier in the Championships, the Crowe Horwath Business Services Manager entered her favoured event determined to go one better. She delivered in the most emphatic fashion, recording the fastest qualifying time, nearly five seconds faster than the nearest competitor in her age group. She backed that up with a dominant ride in the final to take victory by 5.7 seconds. After narrowly missing gold earlier in the event, Wednesday’s victory was all the sweeter for Criglington. “It was such an awesome feeling to hear the national anthem and see the New Zealand flag raised,” Criglington said in an email to supporters on Wednesday. Criglington claimed silver in the 500 metre time trial on Monday morning, finishing just 1.1 seconds behind Great Britain’s Alison Chisholm and then doubled her silver tally in Tuesday’s scratch race, being pipped on the line after making her move with a lap to go. Criglington then partnered Dutch rider Carolien van Herrikhuyzen to finish second in the Team Sprint, a non-championship event. Wellington-based Cycling Southland member Simon Lusk added to New Zealand’s impressive tally with silver in the 55-59 Men’s Individual Pursuit on Tuesday, qualifying fastest but being beaten in the ride for gold. Invercargill’s Roger Nicholas also featured strongly in the Men’s 45-49 Sprint, qualifying ninth with a new personal best of 12.035 before being narrowly beaten in his quarter final against the top seed, ultimately finishing eighth in the world. The Masters World Championships feature 400 entries from 28 countries and continue until Sunday, New Zealand time.